Like many racers, Lang Hindle started on his out as a mechanic. His interest quickly expanded to the world of racing, and in 1969 on a 650 BSA he made his first attempt at it on the famous Mosport circuit. Finding it very much to his liking, Lang next acquired a BSA Rocket 3 and embarked on racing career that was to see him achieve considerable success not only as an accomplished racer but also as a successful businessman, gaining world wide recognition in the process! Through 1970-72, Lang continued to race the now highly modified BSA, classified as an unlimited class machine, because Lang had built the frame, swing arm and of course, the exhaust system! He managed to win the Junior Championship on the modified BSA Rocket 3 running against more modern, sophisticated and powerful Honda fours and Yamaha 700 machinery. Quite an accomplishment! Following this success, Lang turned Pro riding a modified Z1 Kawasaki as a privateer. In his first Pro race at Sanair, Quebec, Lang literally blew the field away and went on to win by half a lap! This essentially was the start of his successful racing career. Lang was particularly adept at Endurance Racing winning the North American Endurance Championship in 1974, 1975 and 1976. He won numerous Endurance races, and set a World Record at Daytona in 1981 for the most distance covered in a 24 hour race. Lang did most of the night riding, and also double shifts on the physically demanding Daytona track. For 1997 and 1998, Lang took a brief hiatus to concentrate on raising his family. He returned to racing in 1980 and in 1981 captured the Canadian National Superbike Championship on his Kawasaki KZ1000. 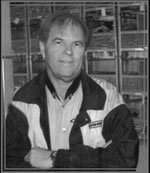 It has been said of Lang Hindle that he is the “Father” of the Canadian Superbike racing class in Canada competing in the early BRIMACO, CMA, RACE and a host of other sanctioning group events. He set the pace for the new class, culminating with the overall Eastern Canada Championship in the first ever season of RACE in 1981. In the process, he did a good deal of fabrication work for many of his competitors, and helped a selection of up and coming riders and future Champions such as Rueben McMurter, Art Robbins, Paul McMillan and Michel Mercier! IN 1982 Hindle ran the coveted #1 plate, and also with CASTROL support ran a second machine in bigger events with no less a rider than Yvon Duhamel! Lang essentially ended his serious racing career at Shannonville in 1982. It was at about his time period in the early eighties that Lang developed his Exhaust business. His operation began in his garage at the back of his home in Scarborough, and one of his initial attempts was on the 1969 BSA on which he started his racing career. The business progressed rapidly, and by the early 1990s’ the Hindle exhaust system was a staple on race tracks around the world. Hindle pipes certainly helped lead the Supersport revolution. It is fairly safe to say that the majority of successful Canadian racers, manufacturers and tuners have worked with the Hindle team in the development of their racing programs. Hindle Exhaust proudly sponsored the National Pro 600 Sport Bike class for four consecutive years. Lang enthusiastically seized this sponsorship opportunity as it, as he stated in his own words “Provided him with the opportunity to give something back to the sport that had given so much to him”. The tradition of Lang Hindles and the Hindle Exhaust system involvement in our sport continues today and will continue for many years to come.